It’s been on a drawing board for several years and now it’s coming close to fruition. 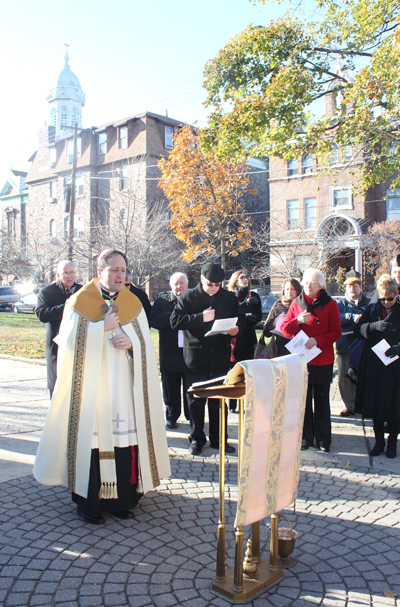 Bishop John J. McIntyre, in his capacity of oversight over Catholic Health Care Services, presided at a Nov. 21 blessing service in Port Richmond’s Campbell Square, directly across the street from the former Nativity B.V.M. School. A year or so from now after an expenditure of more than $12 million, the almost century-old but solidly constructed building will have been transformed into Nativity B.V.M. Place, a residence for elderly citizens of moderate income. The bulk of the funding for the renovation is through a U.S. Department of Housing and Urban Development (HUD) grant with further funding from Philadelphia’s Office of Housing and Community Development (OHCD). The school, which as recently as the 1970s had more than 900 pupils, will now be converted into 63 single-bedroom apartments. The 520-square-foot apartments will consist of a living room, bedroom, kitchen and bath designed specifically to meet the challenges often faced by the elderly. 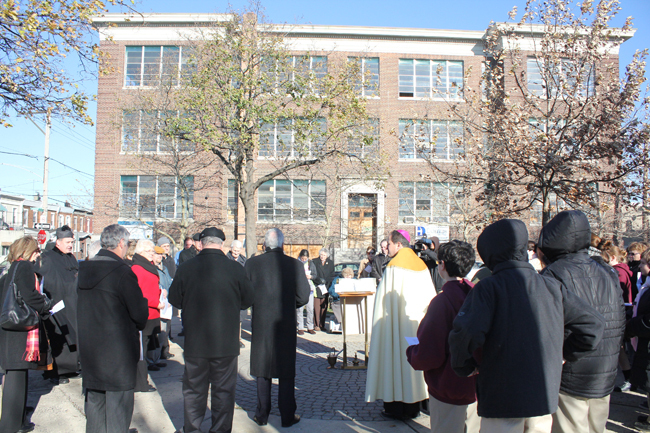 “This long-awaited development will convert this building, which was once dedicated to Catholic education, to now serve the needs of beloved older members of this surrounding neighborhood and community,” Bishop McIntyre said in his remarks. Attending the ceremony were archdiocesan and parish leaders, civic officials, residents of the neighborhood and fittingly, seventh and eighth grade students from nearby Our Lady of Port Richmond School (formerly St. Adalbert School), which Nativity students now attend. 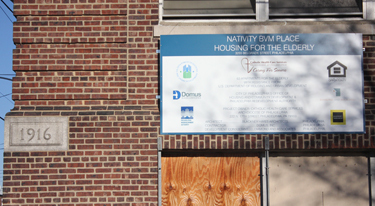 “This is just another indication of the Archdiocese of Philadelphia and Catholic Human Services coming back into the community,” said Joseph Sweeney, who noted similar projects under way in Northern Liberties and South Philadelphia among others. John Wagner, the director of project development for Catholic Health Care Services, explained the building was given by the parish not to the archdiocese but to a newly formed independent 501c3 organization that now owns the property. That was a requirement to obtain the federal grant, although it will be administered by Catholic Health Care Services. Also present was Father Dennis Fedak, pastor of Nativity and St. Adalbert parishes. As a parishioner of Nativity I put 4 children through Nativity BVM school. As a neighbor I love what is happening to the building of Nativity Place. What a bright cheerful change from the emptiness of abandonment long awaiting change and a chance for new life. May everyone who enters hear the echo of laughter once again in the halls of Nativity. What a wonderful idea to make this happen for the senior citizens. Port Richmond is their home, and for them to stay is very important. Thank you for your hard work, and thoughtfulness .